The Visconti Bronze Swirl is the latest limited-edition demonstrator collection for 2018, with 888 pieces crafted for the entire world. Visconti�s demonstrator writing instruments are based on the iconic shape of the Homo Sapiens collection. The cap of the Bronze Swirl is made out from a solid block of specific resin, crafted to fit the high-quality standards of Visconti both in strength and color. The core of this collection is seen within the body. The contrast between the brown and ivory tones on the pen�s body recalls true ivory. The rich color mixed with the bronze swirls on the transparent resin delivers a look of elegance and beauty. Visconti uses a special material to create this writing instrument, a special mixture of celluloid and polycarbonate mixed in a secret formula. The Visconti Bronze Swirl is the latest limited-edition demonstrator collection for 2018, with 888 pieces crafted for the entire world. Visconti�s demonstrator writing instruments are based on the iconic shape of the Homo Sapiens collection. The cap of the Bronze Swirl is made out from a solid block of specific resin, crafted to fit the high-quality standards of Visconti both in strength and color. The core of this collection is seen within the body. The contrast between the brown and ivory tones on the pen�s body recalls true ivory. The rich color mixed with the bronze swirls on the transparent resin delivers a look of elegance and beauty. Visconti uses a special material to create this writing instrument, a special mixture of celluloid and polycarbonate mixed in a secret formula. The pen is equipped with Visconti�s famous Double Reservoir Power filling system and the iconic 23kt Palladium nib available in M,F,XF,B,and Stub. Visconti's il Magnifico collection embodies the essence of the Renaissance period, combining luxurious and precious materials. The cap and blind cap are made from solid 925 sterling silver and is finely chiseled with the fleur-de-lis motif, a symbol of Florence. The top of the cap is enriched with the ancient coat of arms of the Medici family. The body of the pen is made from solid Italian Levanto marble and is faceted on eight sides like the Baptistery of Florence, whose famous doors are symbols of the Italian Renaissance. Visconti selected a rich green marble for the Serpentine which was inspired by elements of the Santa Maria Novella church in Florence. Florence at midnight gets swallowed by darkness and reveals aspects of its beauty unknown in daylight. Suddenly the edges of the joyous iconic structures shade into dark grey, purple and blue tones so that the imagination of a visitor can be unleashed and see beyond the substance of reality. The Homo Sapiens Midnight in Florence is limited to only 888 pieces, is a real proof of how precious Visconti demonstrator pens and revealing to the passionate beholder an exquisite inner craftsmanship behind the surface of the body in Acryloid in transparent dark purple and grey. The fountain pen is enhanced with a 23kt palladium nib, available in M, F, XF, B and 1.3mm stub widths and has a High Vacuum, double reservoir filler. The collection is completed with a matching rollerball. The Ocean Breeze collection is inspired by Santorini, Greece, an island famous for its strong winds and rolling waves that surround the coastline. The island of Santorini is nestled in the southern part of the Aegean Sea, 120 miles southeast of Greece's mainland. It is the largest island in a small, circular island chain. Santorini was formed after a volcanic eruption destroyed the earliest settlements on a previously single island. The Ocean Breeze collection is crafted with Visconti's famous acryloid resin, a special mixture of acrylic resin and celluloid. The resin on this demonstrator writing instrument has been expertly mixed to invoke the swirling breezes found on the Santorini coast. The Ocean Breeze features a uniquely engraved grip with a wave motif, reminiscent of the waves in the south Aegean Sea. The Ocean Breeze collection is available as a fountain pen with two different trims: Palladium plated (Limited to 118 Fountain Pens) and Rose gold plated (Limited to 48 Fountain Pens). Both styles of the Ocean Breeze are equipped with Visconti's Double Reservoir Power Filler and its large 23kt Dreamtouch nib available in M,F,EF,B and Stub widths. Many famous sea explorers were Italian, such as Amerigo Vespucci, Cristoforo Colombo, and Da Verrazzano. Portofino is a beautiful fishing village and harbor in the Liguria region of Italy, nestled on the north coast of the Mediterranean Sea. Visconti has always combined style and creativity, the taste for color and the attention to details, the use of unusual materials, which are part of Visconti�s' high-end traditional craftsmanship. The Portofino collection celebrates a luxurious Italian costal destination, as well as a passion for the sea life, most importantly, sailing. The Portofino collection aims to re-imagine the luxurious feeling of vintage Italian sailboats by incorporating nautical materials such as stainless steel and teak wood. The wooden body is enriched with a thin metallic frame with lacquered details; the cap is decorated with two metal rings and enamel. The pen utilizes a screw closing system for easy use. The clip is unique to Visconti, taking inspiration from the Ponte Vecchio Bridge in Florence, Italy, revealing the origin of the brand. The fountain pen is enhanced with an 23kt Palladium Dreamtouch nib, available in M,F,XF,B and Stub. Power filler. With a design inspired by futuristic ideals and a need for speed, we are excited to introduce Visconti's Torpedo collection. The Torpedo is Visconti's newest Limited Edition collection, with only 188 pieces crafted for the entire world. The Torpedo is inspired by the Bolidismo Movement, an architecture and design movement created by a group of young Italian designers and architects in the mid 1980s. The movement's design elements are seen in architecture that is strongly influenced by the world of car design, including the Torpedo model that was popular in the 1930s. The Torpedo's name alludes to both the model of car and the english term for torpedo, an example of a shape designed for movement and speed. The Torpedo is designed in an ogival shape with a round, tapered end. The writing instrument is powerful and aerodynamic, combining two stylistic components of Visconti's high end pens: a demonstrator within a skeleton body. The pen itself is made from unidirectional carbon graphite, a common material used in the automotive sector. The demonstrator design allows the user to see the internal filling system and ink through the transparent openings, located between the metal covers and the skeleton body. The skeleton body features a transparent acrylic resin designed to align with the carbon graphite, contributing to the fluidity of the design and alluding to elements of movement and energy. The Torpedo collection features Visconti's famous double reservoir high power filling system and is available in a fountain pen and rollerball. The fountain pen has Visconti's large single tone 23kt palladium nib. The Medici il Magnifico is Visconti's latest masterpiece. The newest addition to Visconti's Medici collection celebrates Italian history and the splendors of Florence, Italy. Lorenzo de' Medici was an Italian statesman and a 15th century ruler of the Florentine Republic. He is considered to be one of the most powerful patrons of the Renaissance age. Medici was commonly known as Lorenzo il Magnifico (the Magnificent) by his contemporary Florentines; Medici was an influential businessman, diplomat, politician and a patron of scholars, artists and poets.As a special addition to the Medici collection, Visconti is proud to dedicate a limited edition writing instrument to the great 15th century statesman.Visconti's il Magnifico collection embodies the ssence of the Renaissance period, combining luxurious and precious materials. The cap is made from solid 925 sterling silver and is finely chiseled with ancient techniques developed by Benvenuto Cellini, a well-known goldsmith and 16th century sculptor.The body of the pen is made from solid Italian Levanto marble and is facetted in eight sides like the Baptistery of Florence, whose famous doors are symbols of the Italian Renaissance. The red marble color of the pen's body was chosen to match the official colors of the Medici family that can be found in the official residence of Lorenzo il Magnifico. The il Magnifico is available as a fountain pen and rollerball. The fountain pen fills via the Visconti high power vacuum filler and features the large 23 kt palladium dreamtouch nib. The il Magnifico is limited to 388 pieces worldwide. Lorenzo de' Medici was an Italian statesman and a 15th century ruler of the Florentine Republic. He is considered to be one of the most powerful patrons of the Renaissance age. Medici was commonly known as Lorenzo il Magnifico (the Magnificent) by his contemporary Florentines; Medici was an influential businessman, diplomat, politician and a patron of scholars, artists and poets.As a special addition to the Medici collection, Visconti is proud to dedicate a limited edition writing instrument to the great 15th century statesman.Visconti's il Magnifico collection embodies the ssence of the Renaissance period, combining luxurious and precious materials. The cap is made from solid 925 sterling silver and is finely chiseled with ancient techniques developed by Benvenuto Cellini, a well-known goldsmith and 16th century sculptor.The body of the pen is made from solid Italian Levanto marble and is facetted in eight sides like the Baptistery of Florence, whose famous doors are symbols of the Italian Renaissance. The red marble color of the pen's body was chosen to match the official colors of the Medici family that can be found in the official residence of Lorenzo il Magnifico. The il Magnifico is available as a fountain pen and rollerball. The Silver Dust Collection takes its inspiration from cosmic dust. Cosmic dust is a type of particle created from tiny crystals released from stars. It is formed when a star, like the sun, sends out atoms. Since studying the particles, scientists have found that cosmic dust exists all over the planet and enters Earth�s atmosphere every day. Visconti celebrates this natural phenomenon with the launch of this exquisite oversized limited edition fountain pen based on the iconic Opera body, featuring the squared circle form, a combination of a square and a circle, to create the perfect ergonomic shape for a writing implement. It has a clear body in acrylic resin with particles that recall the silver cosmic dust. The cap is made from a solid block of specially selected Lucite resin made to fit the high-quality standards of Visconti in both strength and brightness. A completely translucent body swirled with particles that recall the silver cosmic dust represents the heart of the pen. The famous double reservoir filling system can be seen amid the swirls, and the pen features Visconti�s flexible 23kt Palladium Dreamtouch nib available in EF, F, M, B and Stub widths. All pen trim is palladium plated. Visconti�s newest release, the Homo Sapiens Jade, combines Visconti�s world-renowned craftsmanship and innovation with inspiration found in nature. The word �jade� comes from the Latin translation of �pedra de ijada,� where �ijada� means guide. The jade stone represents a true guide, which every man has to seek to improve his behavior. According to legend, jade removes fear and helps guide towards the right decisions. The Visconti Jade has been conceived as the perfect writing instrument to seal important contracts with firm and clear decisions. The Visconti Jade is a limited collection made of 188 pieces for the entire world. Based on the iconic Visconti shape of the Homo Sapiens, the Visconti demonstrator line has always seen great success. The cap of the Jade is made from a solid block of specific resin made to match the high-quality standards of Visconti both in strength and color. The heart of this collection lies within the body. The result is a completely translucent body revealing the famous double reservoir filling system. The pen features their iconic 23kt large palladium nib, available in M, F, XF, B and Stub. Double reservoir power filler. The Aurora Borealis, or more commonly referred to as the Northern Lights in the Northern Hemisphere, is one of the most beautiful naturally occurring phenomena. These bright dancing lights can be seen above the magnetic poles of the North and Southern hemispheres. The Northern Lights are a result of collisions between gaseous particles found in the Earth�s atmosphere, with charged particles from the sun�s atmosphere. The variations in color are caused by the type of gas particles that collide. A pale yellowish-green, the most common auroral color, is produced by oxygen molecules located 60 miles above the earth. At the incredibly high temperature above the sun�s surface, collisions between gas molecules are frequent and explosive. The rotation of the sun causes free protons and electrons to fly from its atmosphere, escaping through holes in the magnetic field. The earth�s magnetic field is weaker at the north and south poles, therefore allowing the charged particles to collide with the earth�s gas particles. These collisions emit light that we know as the dancing lights of the north. While many colors can be seen in the Aurora Borealis, green is one of the most common. This specific green hue can only be found naturally in one other way, in the rare blue tea leaf. The blue tea leaf is a known symbol of inner peace and balance, as is the Aurora Borealis. Visconti�s newest release, the Northern Lights, aims to pay homage to the inner balance. This writing tool has been conceived as the perfect writing instrument to keep with us always, and to transmit serenity and inner equilibrium. This particular tone of green reminds us of a pure form of nature and the harmonizing of natural thought (seen as the color yellow) with spiritual thought (seen as the color blue).The Northern Lights fountain pen was created in Visconti�s iconic Manhattan body in acrylic resin with stainless steel trim, and is available in a limited quantity of 188 pieces. The metal parts are chiseled and enameled by the expert hands of Visconti�s skilled artisans. The pen features Visconti�s famous double reservoir filling system with the iconic 23kt large palladium nib, available in M, F, XF, B, and Stub. Double reservoir filler. Casa Batll� is one of Antoni Gaud�'s masterpieces. It is a renowned building located in the center of Barcelona, Spain. A remodel of a previously built house, it was redesigned by Gaud� in 1904. The ground floor is filled with unusual tracery, irregular oval windows and flowing sculpted stone work. Gaud� avoided the use of straight lines almost completely, and much of the facade is decorated with colorful mosaics made of broken ceramic tiles. The locals refer to Casa Batll� as the �casa del ossos�, or the house of bones, due to its skeletal appearance, or the �casa del drac�, house of the dragon because of the arched roof. The roof is arguably one of the most popular features of the home and looks like the back of a dragon. The roof is said to represent Saint George, the patron saint of Barcelona, and the dragon he mythically battled. The pen's body and cap are made of three layers; each one is molded in different materials: acrylic, sterling silver and enamel, representing the facade of Casa Batll�. The shape of the cap and the blind cap reflect the design of the roof built from small colorful tiles. The clip represents the lance of Saint George plunged into the back of the dragon. The fountain pen features the famous double reservoir power filler created and patented by Visconti as well as with their iconic 23kt Palladium nib. The collection has been developed with the support of the owners of Casa Batll�, which celebrated the 110 year anniversary since the rebuilding was completed in 1906. As an ambassador of beauty, art and luxury, Visconti has been chosen to represent the spirit of the famous artist and his masterpiece in this latest creation. Strictly limited to 188 pens in each mode. Daedalus comes from the Greek word daidala which refers to finely crafted objects and is the origin of this creation honoring Greek mythology and Daedalus the mythological Athenian craftsman famous for his ability to invent and construct wondrous things such as the the Labyrinth on Crete, in which he kept the Minotaur, the half man, half bull creature. The Daedalus fountain pen uses Visconti�s well-known skeleton technique and the sterling silver filigree is hand cut and overlaid to show the famous labyrinth and head of the Minotaur on the pen�s body. The process to hand chisel and finish each pen takes several days and the final result is truly a work of art. The translucent blue resin has been specially developed by Visconti experts and includes sterling silver dust to give the effect of the star draped sky overseeing the labyrinth landscape. The Visconti clip and logo on the cap feature matching royal blue enamel. The pen includes Visconti�s famous double reservoir filling system and features a large 23kt Palladium Dreamtouch nib available in EF, F, M, B,and Stub widths. Daedalus comes from the Greek word daidala which refers to finely crafted objects and is the origin of this creation honoring Greek mythology and Daedalus the mythological Athenian craftsman famous for his ability to invent and construct wondrous things such as the the Labyrinth on Crete, in which he kept the Minotaur, the half man, half bull creature. The Daedalus fountain pen uses Visconti�s well-known skeleton technique and the sterling silver filigree is hand cut and overlaid to show the famous labyrinth and head of the Minotaur on the pen�s body. The process to hand chisel and finish each pen takes several days and the final result is truly a work of art. The translucent blue resin has been specially developed by Visconti experts and includes sterling silver dust to give the effect of the star draped sky overseeing the labyrinth landscape. The Visconti clip and logo on the cap feature matching royal blue enamel. Limited edition of 98 pens. The Luxor fountain pen is based on the ancient squared shape of the obelisk and is the result of several techniques handed down over time by the Visconti atelier. The pen is turned from vintage red ebonite and is covered with 8 layers of Japanese lacquer from master Makieshi. This technique is called ikakiji and blossomed during the Edo period, 1603-1868. Maki-e objects were initially designed as household items for court nobles and gained popularity and were adopted by royal families and military leaders as a symbol of power. Archeologists believe the obelisks were originally covered in gold and semiprecious stones reflecting the sunlight as a devotion to Ra, the sun god, and Visconti decorated the pen with reproductions of the original colorful hieroglyphs. To celebrate the importance of Ra to the Ancient Egyptians, his eye symbol is chiseled in 18kt gold at the bottom of the cap. The clip of the pen is shaped as the ancient Egyptian ankh also known as crus ansata, Latin for �cross with a handle�, and is an Egyptian hieroglyphic meaning �life�. The ancient Egyptian gods are often portrayed carrying it by its loop or bearing one in each hand and crossing over their chest. The trims are brass coated with 1.5 microns of pure 18kt gold. The pen has Visconti�s famous double reservoir filling system and features a large 23kt Palladium Dreamtouch nib available in EF, F, M, B and Stub widths. The Chiantishire collection is millesim� like the most important wines and is limited to 888 pieces worldwide. The fountain pen is enhanced with an large 23kt Palladium nib , available in M,F,XF,B and Stub. The filling system is the double reservoir power filler. Once again Visconti introduces a significant innovation to pen manufacture, called Iridium. Iridescence is the physical phenomena that in certain material, based on the angle of view, the color changes following the visible spectrum. Iridescence recalls the rainbow but it also recalls water bubbles or butterfly wings. The movement of the pen and its retractable nib, that evolved in the second edition of Pininfarina with magnetic parts, is a masterpiece of micro-mechanics compared often to a watch�s mechanical movement. With Pininfarina Iridium, Visconti has created in metal the same color effect of the rainbow with a superior resistance to scratches! The fountain pen is enhanced with a Chromium 18 Smartouch tubular nib available in M, F, XF, B and Stub widths and fills via cartridge or the included converter. The Pininfarina Iridium is limited to just 188 pieces. 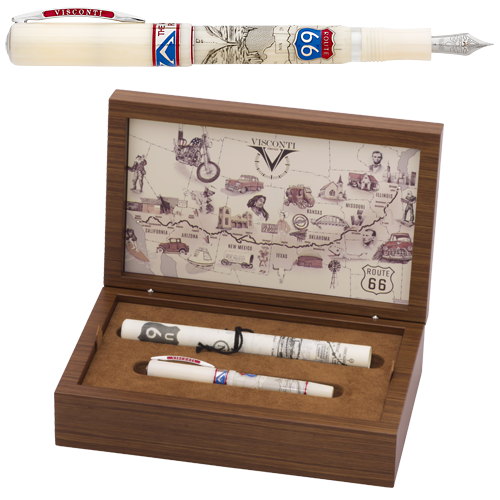 Visconti�s latest creation celebrates the 90th anniversary of the opening of the great Route 66, the famous American highway spanning 2,448 miles beginning in Chicago, Illinois and ending in Santa Monica, California. The road served as a major route for westward migration until the early 1970s, also symbolizing freedom and adventure. Many businesses were founded and thrived along Route 66, helping to drive the economies of the small towns along the route. The road has been celebrated through pop songs, movies and the hit 1960s TV show bearing its name. Affectionately referred to as the �Mother Road�, this title is wrapped in sterling silver with enamel on the ring of the ivory resin cap. The pen�s body features a Route 66 highway marker emblazoned in red and blue enamel. A scrimshaw scene of Route 66 showing the states it intersects along with a scene of the road approaching Sedona, Arizona surrounded by its iconic mountains is carved into the pen. The pen is trimmed with matte palladium. The Route 66 is limited to a total of 366 pens worldwide and is available in rollerball or fountain pen with the Visconti patented double reservoir power filler system, enhanced with the 23kt Palladium Dreamtouch nib available in XF, F, M, B, BB and 1.3mm Stub widths. The Visconti Race Tech is a passion project of the founder of the brand, Dante Del Vecchio, an avid rider and fan of MotoGP and Superbike racing. Visconti pens are often given as a prize to the winner of international motorbike races. The Race Tech will remind aficionados of the lightening holes (on the clip), the carbon fiber (the barrel), and the finish flag (enameled band), all embraced with racing red resin. Fountain pen has Visconti�s Tubular Chromium nib. Limited to 388 pieces. Cartridge/converter fill. Visconti has once again teamed with Pininfarina, famous above all for designing cars such as Ferrari and Maserati. The pen itself is made from unidirectional blue carbon graphite, a material often used in the automotive sector, matched together with yellow gold colored trim. The Pininfarina team has created a design whose salient feature is its purity combined with a successful mix of dynamism and elegant lines, set off by Visconti's technical expertise. The innovative technical featuress that emphasize its style include the rotating nib extraction mechanism, which made it possible to eliminate the cap, and the mechanism incorporated in the clip. Additionally the airtight system that opens and closes automatically, the chromium 18 Smartouch tubular nib and the unidirectional carbon graphite material itself, which gives the pen a perfect weight, with overtones of Pininfarina's automotive activities and a touch of sporty elegance. Great attention was paid also to the case, which echoes the pen's retractable mechanism - that is, in turn, a display case which not only holds the fountain pen, but also has all the makings of a fully-fledged work of modern sculpture. The fountain pen is enhanced with a Chromium 18 Smartouch tubular nib available in M, F, XF, B and Stub widths and fills via a cartridge or included converter. The Pininfarina Carbongrafite is limited to just 188 pieces. Visconti is delighted to announce the latest addition to the Homo Sapiens demonstrator collection - the London Fog. The barrel of the pen features ribbons of finely shaved blue celluloid suspended in clear acrylic resin while the cap and plunger feature the same shaved celluloid suspended in a marbleized silver resin. All trim is crafted in .925 sterling silver. The London Fog is truly a spectacular pen. The London Fog demonstrator is available in fountain pen or rollerball and limited to 888 pieces. The fountain pen features the patented Visconti Double Reservoir Power Filler, a unique filling system that allows a greater ink capacity and safe usage during air flights. The fountain pen is further enhanced with Visconti's large, 23kt Palladium Dreamtouch nib, available in XF, F, M, B, BB and Stub and is filled via the Double Reservoir Power Filler. Visconti�s latest creation pays homage to the Wild West, a pen recalling the ideal of freedom and liberty of the Frontier. Enormous popular attention in the media focuses on the Western United States in the second half of the 19th century, a period sometimes called the Old West, or the Wild West, frequently exaggerating the romance and violence of the period. Frontier history tells the story of the creation and defense of communities, the use of the land, development of markets, and the formation of states� a tale of conquest, but also survival, the merging of cultures, the establishment of law and order; and expansion from coast to coast, fulfilling the dream of Manifest Destiny. The image of the cowboy with his Colt 45 held aloft, riding through the prairie on his horse, has been seen in many Western movies and is the real spirit of the Frontier. Visconti replicates this image on the barrel of the pen using their sophisticated scrimshaw technique. The leather overlay is hot embossed like a cowboy�s saddle and boots, and all trim is made of aged sterling silver and is appropriately ornate. The blind cap features two Colt rifles crossing; the pens plunger reveals the sheriff star. The pen is packaged in a special collector's edition box made from American walnut wood. The top of the box is made from the same leather as the pen. Available in Fountain Pen with 23kt palladium nib, available in M, F, XF, B, BB and 1.3mm stub width and fills via the Visconti power filler. The collection is completed with a matching rollerball. The Watermark is a pen that demonstrates one of Visconti's greatest skills, the artisanal craftsmanship of the cut out filigree, an ability to achieve intricate details with absolute precision. Visconti began crafting filigrees back in 1993 with the launch of the Visconti Uffizi and over the years refined and improved the technique with pens like the Skeleton and the Ripple. This new creation recalls the Visconti logo like paper filigree, repeating the logo along the body and cap of the pen. The design of the pen identifies strongly with the Visconti brand, much like a watermark serves as an identification pattern in paper. The filigree is cut from a solid tube of sterling silver and requires over 20 manual operations to reach the final status. The Watermark Demonstrator is available in rollerball or fountain pen and limited to 888 pieces. The fountain pen features the patented Visconti Double Reservoir Power Filler, a unique filling system that allows a greater ink capacity and safe usage during air flights. The fountain pen is further enhanced with Visconti's large, 23kt Palladium Dreamtouch nib, available in XF, F, M, B, BB and Stub widths. fountain pens and rollerballs in each theme. From 1920 to 1933, Prohibition was a national ban on the sale, production, importation, and transportation of alcoholic beverages. This movement was promoted by conservative groups and other organizations in an attempt to control a variety of perceived social evils such as alcoholism, drug abuse, and gambling. During this era, Speakeasies became a prominent symbol of American culture. Often run by organized crime groups, these secret establishments provided a location for patrons to indulge. To enter, Speakeasies often had a hidden location, passwords, or a special knock. To commemorate this pivotal period in American history, Visconti has created the Limited Edition Speakeasy. The pen, in polychrome celluloid, has a sanitized container inside it that holds a shot of its owner's favorite liquor. An ingenious rotating mechanism in the section allows the user to rotate a window, which states the type of liquor held in the pen. Limited to 1,000 total pieces, the Speakeasy is available in Fountain pen and Rollerball. The Fountain pen features a 23kt Palladium nib in extra fine, fine, medium, broad, double broad, and 1.3 stub. Cartridge fill only. The packaging includes a matching hip flask. The name Visconti is synonymous with luxury, as this Florentine penmaker continues to create pens that are matchless in terms of their materials and accessories. For over 3,000 years, from the splendid buildings of ancient Greece, through the glory of the Roman Empire and the Renaissance, down to the lobbies of the world's leading hotels, Marble has been used as a decorative element symbolizing pure beauty and elegant functionality. Before now, Marble had never been used to make writing instruments by reason of the difficulties inherent in working with it and of its intrinsic fragility. With the assistance of the skilled artisans with whom it has the privilege to work, Visconti has succeeded in grinding marble to an infinitesimal thickness and at the same time it has brilliantly resolved the problem of the material's fragility, thanks to the advanced technology developed in its workshop. For Marble to be used in the manufacture of a pen, it cannot have any cracks, be structurally sound, and its marbling must be patterned in such a way as to ensure that the pen enjoys uniformity. Painstakingly, the marble is sawn into square bars, then hollowed out internally, reinforced, turned on the lathe to the required size and finally polished. Thicknesses are calculated to ensure that the pen's final weight is correct and that it conforms to standards of comfort for daily use. Visconti has chosen four types of marble whose specifications are best suited to the manufacture of pens: Portoro Black; Issoire Green from the Alps; Valencia Cream; and Rain Forest Brown. Only 988 pens are available in each marble. The pens are accented in palladium plate or gold plate depending on the marble selected. Each pen is enhanced with a 23kt Palladium Dreamtouch nib, available in M, F, XF, B, or 1.3mm Stub widths. Piston Fill. The pen ships as a fountain pen and the packaging is equipped with the convertible nosecone and refill to convert the pen to a rollerball. It is only appropriate that Visconti created an exceptionally beautiful pen in honor of a royal wedding. In July 2011, the Principality of Monaco celebrated the wedding of HSH Albert II of Monaco, Sovereign Prince and Miss Charlene Wittstock. On this special occasion and in a tradition of solidarity and generosity so characteristic of the Grimaldi dynasty, the royal couple agreed to the release of a special limited edition pen of just 388 pieces. All profits from the subscription of the pen will be donated to a Monegasque charity chosen by the newlyweds. Each pen is hand-crafted from ivory color organic resin and is cloaked by a hand-crafted sterling silver filigree plated in 18kt rose gold, evoking the Monaco Crown with all its elegant and refined symbols. The filigree reconciles the best of modern technology with traditional values common to both Monaco and Florence. The result is a beautiful writing instrument enriched with the unmistakable craftsmanship of artisan work. The fountain pen fills using Visconti�s patented Double Reservoir Power Filler and features the revolutionary Visconti Tubular nib, available in M,F and B.. Each pen is displayed in a specially hand-made wooden box lacquered in pearlescent white. The Opera Master Demonstrator Crimson Tides is as beautiful as it sounds. Waves of cream and crimson red resin envelop the translucent acryloid. In 1998, Visconti applied for the Italian patent for its Double Reservoir Power Filler, a unique filling system that allows a greater ink capacity and safe usage during air flights. Utilizing this revolutionary Double Reservoir Power Filler, Visconti created the Opera Master Demonstrator. To allow an appreciation of its fine components as well as an unobstructed view of the ink, the resin is clear. Every pen is polished twice: externally and internally, to give just the right finish to the acryloid. The Opera Master is enhanced with Visconti's large, 23kt Palladium Dreamtouch nib. Pininfarina Nanotech Limited Edition with the revolutionary Flexible Tubular Nib. A leader in writing instrument innovation, Visconti turns to Formula One racing for its new Pininfarina pen! Once again a new material for pen-making is introduced, which has been subjected to a diffusion-based carbon nanotube treatment � thus impossible to remove � which is so strong that it is used by such leading Formula One teams as Red Bull, Ferrari and Mercedes. The material also offers excellent antibacterial capability. Coupled with this innovative material used in its pen manufacture, Visconti has also redesigned the pen mechanics in constantly optimizing KaiZen optics. At last, a light metal whose specific weight is one-third that of steel while having better resistance to corrosion than even the best stainless steel and greater resistance to abrasive wear than even hardened steel. It consists of aeronautical materials treated with carbon nanotubes and silver ions. Nanotechnology is a branch of applied science and technology concerned with controlling material on a dimensional scale of less than one micrometer (one-millionth of a meter). And Visconti has perfected the formula in nanotechnology, perfectly tailoring it to the requirements of writing. The fountain pen is enhanced with the revolutionary, flexible 18 chrome tubular Smartouch nib available in M, F, XF, B and stub widths. Filling is via a retractable converter-based mechanism. Limited Edition of 930 fountain pens and 903 rollerball pens. The unique design of the pen features ribbons of finely shaved celluloid suspended in clear acrylic for the barrel while the cap and plunger feature the same finely shaved celluloid suspended in translucent resin. The filling system for the fountain pen features Visconti�s power filler made with titanium for long lasting function. The clip and cap rings are all crafted in fine .925 sterling silver. The fountain pen is enhanced with Visconti�s famous �Dream Touch� 23kt Palladium nib in EF, F, M, B, BB and 1.3mm Stub widths. Only 1,000 fountain pens and rollerballs combined are available. The Homo Sapiens Crystal Florentine Hills comes in a luxurious Visconti dark brown lacquered gift box. The unique design of the pen features ribbons of finely shaved celluloid suspended in clear acrylic for the barrel while the cap and plunger feature the same finely shaved celluloid suspended in blue-green translucent resin. The filling system for the fountain pen features Visconti�s power filler made with titanium for long lasting function. The clip and cap rings are all crafted in fine .925 sterling silver. The fountain pen features Visconti�s famous �Dream Touch� 23k Palladium nib in EF, F, M, B, BB and 1.3mm Stub. Only 1,000 fountain pens are available worldwide.. The Homo Sapiens Crystal Swirls comes in a Visconti dark brown lacquered gift box. Oud, or agarwood, is becoming one of the most popular fragrances in the West, used principally either as an essence, or it may be burned in tiny braziers to release its pleasing aroma.. Only a few years ago it was almost unknown, mostly known to those who enjoy designing fragrances by matching its woody, almost balsamic aroma with flowers, fruit and spices. Visconti holds writing instruments so dear; much more than writing tools but a way to celebrate certain aspects of this wonderful world we live in. With this exquisite collection, Visconti has added olfaction to the writing experience. In praise of the Oud, or agarwood, Visconti has created a pen inspired by the Middle Eastern culture in which agarwood is a much-loved fragrance used in most every household. Thus the pen serves as a means for always having one's favorite essence with one, yet without being a mere container. The head above the pen clip serves a dual function: it acts as a vessel for a fragment of agarwood which can be used in an emergency and burnt, while the perforated part contains a spongy area which can be soaked with the essence inside the box and serve as an air freshener. The lower part of the body of the pen, known as the bottom plate, provides access to a metal container in which the user can place a small amount of essence for use as a perfume, thus always having it at hand. The pen's gold vermeil filigree decoration is inspired by the logo for Expo 2020 in Dubai. The pen's luxury perforated wooden box has the same theme, containing a small bottle of essence and agarwood-scented ink for fountain pen lovers. The fountain pen features Visconti�s famous �Dream Touch� 23k Palladium nib in EF, F, M, B, BB and 1.3mm Stub and is enhanced with the famous power filler. Only 388 fountain pens and 388 rollerball have been produced worldwide. Exactly seven hundred years have elapsed since the death of Jacques de Molay, the last Grand Master of the Order of the Knights Templar. Falsely accused of heresy, the order was suppressed in 1308, the knights imprisoned, tortured, slain, and their property confiscated. The Templars are renowned for the economic and cultural advances that they helped to spread throughout Europe, and are still held up today as shining examples of honesty, integrity and loyalty. The pen is inspired by the Templars' legendary white surcoat emblazoned with a red cross. The Templar helm, hauberk and crest are reproduced with the finesse of the goldsmith's art. The Templars were a military order, thus the pen's finish is inspired by appropriately aged steel and iron. The Templar's historical seal, showing two knights on a single horse, symbolizing their poverty and their dual nature as monks and soldiers, has been built into the ring. Nor could the set be considered complete without the Templar sword. A leather wrap serves to protect this valuable writing tool. The fountain pen features Visconti�s famous �Dream Touch� 23k Palladium nib in EF, F, M, B, BB and 1.3mm Stub and is enhanced with the famous power filler. Only 777 combined rollerballs and fountain pens produced worldwide. 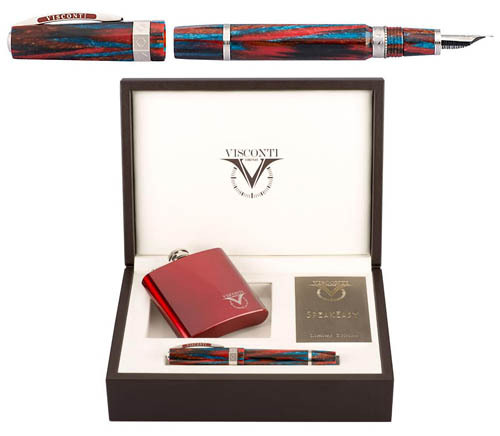 Visconti welcomes a USA exclusive Limited Edition. The Red Divina makes a strong statement showing Visconti's passion for superior writing instruments. Made from natural vegetal resin, the color red is associated with energy and power. With sterling silver rods that spiral over the pen, the Divina is an iconic Visconti design that will impress. Available in fountain pen, rollerball, and ballpoint. The fountain pen is piston fill and features the Dreamtouch 23K Palladium nib available in extra fine, fine, medium, broad, double broad, or stub widths. 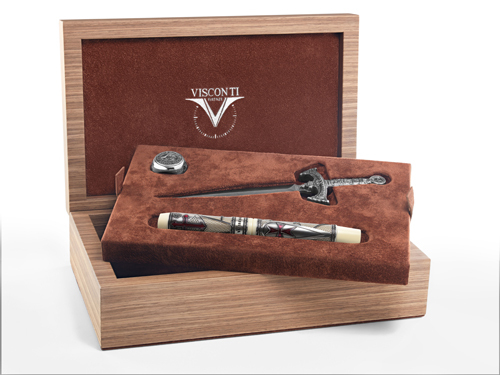 Visconti welcomes a USA exclusive Limited Edition. The Red Divina makes a strong statement showing Visconti's passion for superior writing instruments. Made from natural vegetal resin, the color red is associated with energy and power. With sterling silver rods that spiral over the pen, the Divina is an iconic Visconti design that will impress. Available in fountain pen, rollerball, and ballpoint. The fountain pen is piston fill and features a 23K Palladium nib available in extra fine, fine, medium, broad, double broad, or stub. Visconti�s magnificent limited edition celebrates the holy city that gave origins to three monotheistic religions: Islam, Judaism and Christianity. The pen is inspired by the Dome of the Rock, located adjacent to the Al Aqsa Mosque on the Temple Mount in Old Jerusalem � sacred ground for all three faiths. The large, octagonal pen echoes the structure of the eight-sided Dome, which was patterned after the Christian Church of the Holy Sepulchre. The fountain pen�s ornate panels are inlaid with exclusive vegetal resins that recall the colors of the Israeli flag and the Islamic ceramic tile mosaics on the Dome�s exterior. The gold-plated top of the cap is an exact replica of the Dome. The clip is encrusted with semi-precious stones made from a material much like that of the �Foundation Stone� preserved inside the Mosque. Al Aqsa is the final creation in Visconti�s �Religions� collection which includes the Bible (2009), the Mecca and Medina (2011), and the Twelve Tribes (2012). Accented in precious vermeil, Al Aqsa is limited to 691 pieces worldwide of each of the Fountain Pen and Rollerball. Visconti�s 23kt Palladium Dreamtouch nib and Power Filler system complete the fountain pen, bottle fill only. The Dreamtouch nib is available in the widths of M, F, B, XF, BB and Stub 1.3mm. Each Al Aqsa is presented in a beautifully gilded, hand-cut wood box worthy of its precious contents. The St. Basil�s Cathedral Limited Edition from Visconti is an homage to this Russian icon and UNESCO World Heritage site, located in the center of Moscow. Built over a period of six years in the 1550�s, the cathedral itself is shaped as a flame of a bonfire rising into the sky, a complex and multi-detailed design that bears no resemblance to any other Russian building. The pens are created from multi-hued celluloid to evoke the colors of the extraordinary cathedral. Cured for five years, the celluloid is enrobed with an engraved, vermeil overlay and band (gold plating over.925 sterling silver), and topped with a genuine ruby gemstone. Bottle fill only via Visconti�s patented power filler. The handmade wooden presentation box is enhanced with solid gold leaf designs. The 23kt Palladium Dreamtouch nib is available in M, F, B, XF, BB and Stub 1.3mm widths. Limited to 561 total fountain pens and rollerballs combined. With its heritage back to 1930, Pininfarina is now one of the most successful car designers worldwide, both exterior and interior design thanks to its expertise, creativity and innovation. The Company is today a proud partner of companies like Ferrari, Maserati, Alfa Romeo, Rolls-Royce and Jaguar. In light of the common values and strengths shared by their companies, following the worldwide launch of the signature *PININFARINA EXTRA* at the 2009 Milano Car Show, Paolo Pinifarina and Dante Del Vecchio, the founder of Visconti, decided to develop together an extraordinary and unique writing instrument. Underlining their passion for new technologies, Paolo Pininfarina described the collaboration with Visconti : *Design is the only instrument to make innovation human*. Dante Del Vecchio stated: *great innovation that is behind our creations is projecting us into the future*. Highlights of the Pininfarina 1930 in Carbongraphite(TM), a remarkable, virtually indestructible material, never before used in pen manufacture. *Over two years in the making, four different designs and engineering processes, numerous quality tests and technical challenges. There are 930 pieces each of the fountain pen and rollerball. Filling is via cartridge or converter. The special nib is available in F, M, B and Stub widths. The pen is housed in a high tech, extractable Carbongraphite box�truly a modern sculpture in itself. Visconti celebrates the year of the Dragon, one of the 12-year cycle of animals which appear in the Chinese zodiac and Mongolian zodiac, and the only animal that is from a fairy tale. The Year of the Dragon is associated with the earthly branch symbol. Dragons are powerful mythical creatures celebrated by Chinese culture. Dragons symbolize strength, well-being, harmony, and intellectuality. In Eastern philosophy, the Dragon is said to be a deliverer of good fortune and a master of authority. Therefore, those people born in the year of the Dragon have a sense of honour, respect, audacity, and loyalty. Visconti has master crafted a Chinese dragon in gold vermeil, lacquered in multiple layers of colour like only the ancient Florentine masters could do. Visconti uses a natural black resin as the back drop, creating a silhouette against the array of striking colors and imposing imagery of the vermeil overlay. This striking pen utilizes the Visconti double reservoir power filler and is presented in a magnificent dragon display. Only 888 pens world-wide. The fountain pen is enhanced with a 23kt Palladium nib, available in M, F, XF, B, BB and 1.3 Stub widths. Visconti celebrates the year of the Dragon, one of the 12-year cycle of animals which appear in the Chinese zodiac and Mongolian zodiac, and the only animal that is from a fairy tale. The Year of the Dragon is associated with the earthly branch symbol. Dragons are powerful mythical creatures celebrated by Chinese culture. Dragons symbolize strength, well-being, harmony, and intellectuality. In Eastern philosophy, the Dragon is said to be a deliverer of good fortune and a master of authority. Therefore, those people born in the year of the Dragon have a sense of honour, respect, audacity, and loyalty. Visconti has master crafted a Chinese dragon in gold vermeil, lacquered in multiple layers of colour like only the ancient Florentine masters could do. Visconti uses a natural black resin as the back drop, creating a silhouette against the array of striking colors and imposing imagery of the vermeil overlay. This striking pen utilizes the Visconti double reservoir power filler and is presented in a magnificent dragon display. Only 888 pens world-wide. The Twelve Tribes Limited Edition. Visconti*s latest creation pays tribute to ancient history and the 12 Tribes of Israel. The sacred Torah traces the Israelites to Jacob, grandson of Abraham. Jacob, who was later renamed *Israel* after a mysterious incident in which he wrestles with an angel or God, had 12 sons who became the ancestors of the 12 Tribes. After conquering Israel, each tribe occupied a separate territory in the holy land of Israel. The Visconti 12 Tribes pen is enriched with Biblical symbols and historical meaning. Distinctive signs and images attributed to each of the tribes are engraved into the pen through a scrimshaw process and each Tribe features different color enamels, matching the one on the Pectoral. The body of the pen is made from ancient .925 silver and features a feint engraving of an olive tree branch, standing for peace and prosperity. The pen body has a unique rotating system and unveils, one after another, the tribes of Israel from right to left (as Hebrew is read). The clip is modeled after the hand of the Torah. The five fingers are often considered to represent the five books of the Torah. Other symbols such as the Menorah and the Star of David are also engraved. The precious-resin cap is blue and white, like the flag of Israel. Every piece is presented in a round wooden case, shaped after the one containing the Sefer Torah. This limited edition is made up of 512 writing instruments in solid silver, fountain pen and rollerball, 12 representing the number of tribes and 5 the books of TANACH. The fountain pen is enhanced with the Palladium 23 Kt. Dreamtouch nib, available in M, F, XF, B, BB and 1.3mm Stub. The pen is filled via the Visconti Power Filler System. Visconti*s latest creation pays tribute to ancient history and the 12 Tribes of Israel. The sacred Torah traces the Israelites to Jacob, grandson of Abraham. Jacob, who was later renamed *Israel* after a mysterious incident in which he wrestles with an angel or God, had 12 sons who became the ancestors of the 12 Tribes. After conquering Israel, each tribe occupied a separate territory in the holy land of Israel. The Visconti 12 Tribes pen is enriched with Biblical symbols and historical meaning. Distinctive signs and images attributed to each of the tribes are engraved into the pen through a scrimshaw process and each Tribe features different color enamels, matching the one on the Pectoral. The body of the pen is made from ancient .925 silver and features a feint engraving of an olive tree branch, standing for peace and prosperity. The pen body has a unique rotating system and unveils, one after another, the tribes of Israel from right to left (as Hebrew is read). The clip is modeled after the hand of the Torah. The five fingers are often considered to represent the five books of the Torah. Other symbols such as the Menorah and the Star of David are also engraved. The precious-resin cap is blue and white, like the flag of Israel. Every piece is presented in a round wooden case, shaped after the one containing the Sefer Torah. This limited edition is made up of 512 writing instruments in solid silver, fountain pen and rollerball, 12 representing the number of tribes and 5 the books of TANACH. This remark may bring a smile to our lips today, but in 1497 the letter that the Florentine navigator Amerigo Vespucci addressed to Lorenzo de Medici caused such a stir that when Martin Waldseemuller drew the first map of America 10 years later, he named the continent after the feminized Latin version of Vespucci*s name: Americus Vespucius. This notable explorer traveled to the New World on 4 separate occasions, discovering Rio de Janeiro and giving Venezuela, or *Little Venice,* its name. 2012 marks the 500th anniversary of the birth of Vespucci. To create a pen commemorating this important anniversary, Visconti took inspiration from symbolic events and documents, primarily Vespucci*s travels themselves and Waldseemuller*s famous map of 1507. To reproduce portions of the map correctly, Visconti further perfected its scrimshaw technique on special ivory resin, introducing points and chiaroscuro into the graphic work, and embedded the scrimshaw into the pen*s surface. Visconti*s unique 23kt palladium Dreamtouch nib enhances this masterpiece, available in M, F, XF, B, BB, and stub widths. Limited to a total of 500 fountain pens and rollerballs combined in bronze trim and 50 fountain pens and rollerballs combined in 18kt gold. The fountain pen is filled via the exclusive Visconti Power Filler system. The special presentation box reproduces an astrolabe, the instrument that�in conjunction with the quadrant�allowed Vespucci to complete his voyages. Visconti*s latest limited edition, Istos Aracnis, (Greek for Spider), pays tribute to the famous myth of Arachne*s weaving competition with the goddess Athena and her subsequent transformation into a spider. The Istos Aracnis is made from black Lucite with a sterling silver overlay in a web pattern enameled in white to highlight its intricate design. The Spider fountain pen offers a double reservoir power filler system and features the Visconti Dream Touch 23K palladium nib in your choice of five sizes. Limited to 888 pieces worldwide. Dual Reservoir Power Filler/Bottle fill only. As always, Visconti pays special attention to themes that have impact, changing and describing life and the world in which we live. The Mecca and Medina are the latest additions to the Mystic Pen Collection, a series of fountain pens dedicated to all people and religions of the world. The Mecca and Medina pay tribute to the spiritual leader Muhammad, the founder of Islam. The great city of Mecca is the birthplace of Muhammad, near which he received his first revelations from God, and thus, began the religion of Islam. The body of the pen is turned from shiny black lucite to create a shape reminiscent of the architecture of the Kaaba, the most sacred site in Islam. Palladium-plated sterling silver comprises the trim throughout the pen. This cube shaped building located in Mecca predates Islam and was built by Abraham, the father of the Hebrew nation. The Kaaba was made of granite from the surrounding hills outside Mecca. Each of the four sides is scrimshawed with Arabic verses from the Qu'ran. They are inspired by the Kiswah, an embroidered black cloth that covers the Kaaba. The rings evoke the stone pieces used to build the structure. The pen is limited to 622 pieces in honor of the year Muhammad and his followers migrated to Medina, also known as the Hijra.The fountain pen is filled via the Visconti Power Filler, and is enhanced with their exclusive 23 kt Palladium nib. Only 622 fountain pens have been produced. The rollerball is available by Special Order and is un-numbered. As always, Visconti pays special attention to themes that have impact, changing and describing life and the world in which we live. The Mecca and Medina are the latest additions to the Mystic Pen Collection, a series of fountain pens dedicated to all people and religions of the world. The Mecca and Medina pay tribute to the spiritual leader Muhammad, the founder of Islam. Medina is the burial place of Muhammad, the second most sacred site in Islam. His tomb is located in one of the three oldest mosques in Islam. The body of the pen is turned from ivory colored resin. The green marbled cap recalls the green dome under which Muhammad is buried. The microcast artwork in gold vermeil (gold-plated sterling silver) around the pen signifies the doors leading to his tomb. The clip reminds us of the many columns that may be found inside the mosque. The pen is limited to 622 pieces in honor of the year Muhammad and his followers migrated to Medina, also known as the Hijra.The fountain pen is filled via the Visconti Power Filler, and is enhanced with their exclusive 23 kt Palladium nib. Only 622 fountain pens have been produced. The rollerball is available by Special Order and is un-numbered. Declaration of Independence Limited Edition...Adopted by the Continental Congress on July 4, 1776, the Declaration of Independence announced that the 13 American colonies, then at war with Great Britain, were independent states, and thus no longer part of the British Empire. The Declaration listed the colonial grievances against King George III, and rights, including a right of famously made a statement of individual human rights�*We hold these truths to be self-evident, that all men are created equal, that they are endowed by their Creator with certain unalienable Rights, that among these are Life, Liberty and the pursuit of Happiness*. For almost 250 years, for many, this has represented a moral standard for which the United States should strive. Appropriately, Visconti pays tribute to this most important of dates with a unique limited edition fountain pen since a pen was used by the signatories to the statement. 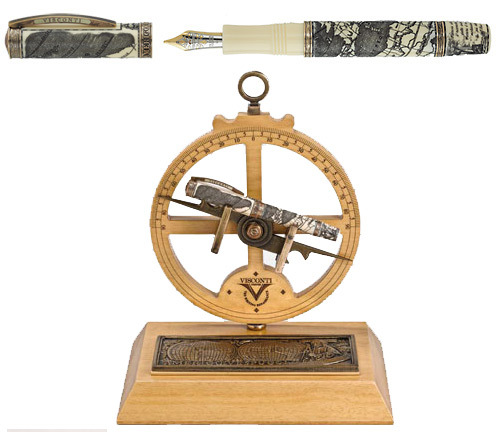 Visconti uses their sophisticated scrimshaw technique on special resin to replicate the full text of the Declaration of Independence into the barrel of the pen. A specially engraved magnifying glass is included to pay closer attention to the intricate details. All trims are made of aged sterling silver. The end-cap is engraved with the American bald eagle, a symbol of Freedom. The power-filler mechanism is operated by the Liberty Bell, an iconic symbol of American Independence. Visconti�s unique 23 kt Palladium nib enhances this masterpiece, available in M,F,B,BB and Stub. Limited to a total of 776 Fountain pens and rollerballs combined, in sterling trim and 76 Fountain pens and rollerballs combined in 18 kt gold. The Wall Street Limited Edition is reminiscent of the Manhattan skyline at night and is a spectacular pen made from solid celluloid available in translucent red, green or platinum. The entire pen is made from the pearlescent celluloid, including the grip section making for a very comfortable writing experience. The pens combines Visconti�s unique �squaring of the circle� design with the much loved �bridge� clip, all trims are plated in platinum. This oversize pen is available in fountain only and features Visconti�s new Dream touch 23kt palladium nib, available in M, F, B,XF and stub. a truly super smooth writing experience. The pen fills using Visconti�s patented �double reservoir power filler�, so you can use your pen on a airplane without leakage! It also fills with up to 9 cartridges of ink! The Wall Street Limited Edition is reminiscent of the Manhattan skyline at night and is a spectacular pen made from solid celluloid available in translucent red, green or platinum. The entire pen is made from the pearlescent celluloid, including the grip section making for a very comfortable writing experience. The pens combines Visconti�s unique �squaring of the circle� design with the much loved �bridge� clip, all trims are plated in platinum. This oversize pen is available in fountain only and features Visconti�s new Dream touch 23kt palladium nib, available in M, F,and stub. a truly super smooth writing experience. The pen fills using Visconti�s patented �double reservoir power filler�, so you can use your pen on a airplane without leakage! It also fills with up to 9 cartridges of ink! Herodotus used the name *Griffins* (Treasurers of the Gold) for the nomadic tribes wandering the steppes east of the Ural Mountains and the Caspian Sea (currently Kazakhstan territory). And he was not wrong at all, considering that the fifth century BC mysterious prince Saka has been discovered in his tomb completely covered in gold clothes. This Golden Man, an armed warrior, used to adorn himself with thousands of jewels- gems and gold- representing leopards, ibex, winged horses and floral motifs � evidence of the animalistic art used by these nomads, rulers of the Asian steppes, to convey their emotions and their view of the world. Visconti has created a wonderful pen inspired by the myth of the Golden Man that reflects the same motifs of the Scythian art, artistically reproducing the magic of the mysterious warrior. The original colours and naturalistic symbols of the pen convey the same emotions as those of the ancient tribes that clothed their princes in solid gold! Add to that the fact that although the tribes inhabited distant lands, they reached Europe in their migrations during the fall of the Roman Empire which will give you the feeling that you have contributed to the history of the European Middle Ages just as the Scythians did. Overlain in gold vermeil (gold plating over .925 sterling silver) in the lost wax method, this red lacquered masterpiece features Visconti�s Power Filler and is enhanced with the 23 kt Palladium Dreamtouch nib. Strictly limited to 388 Fountain Pens worldwide. Founded in 421 A.D., Venice is a masterpiece of nature, consolidated along 400 years of barbaric invasions, and not just projected by some architect�s hand. Throughout the 7th century A.D. Venice, a Sea Republic, was the main connection between East and West. This position highly contributed to its cultural development, allowing Venice to become one of the finest cities in Europe and later on during the Renaissance one of the most influential for art, architecture and literature of the time. After almost one thousand years of complete independence, on May 12, 1797, the doge Ludovico Manin and the High Council were constrained to abdicate. Napoleon consequently proclaimed the Temporary Government of the Town and yielded Venice to the Austro � Hungarian Empire. In 1866 Venice joined the Reign of Italy. After 2009�s Florentia fountain pen, Visconti pays tribute to another great Italian city�Venice, a destination loved by millions of tourists each year. The Venetia limited edition fountain pen is a masterpiece of symbols and icons; it will make you live an emotion and you will feel the atmosphere ofVenice and its world right there, in your hands: the canals, the gondolas, the bridges, the characteristic windows. Available with sterling silver overlay in an edition of 421 fountain pens (cartridge/converter fill), or gold vermeil overlay in an edition of 99 fountain pens (featuring Visconti�s high power vacuum filler), each enhanced with Visconti�s exclusive Palladium Dreamtouch nib. The vermeil edition ships in a full wood desk display with crystal inkwell, pen stand and blotter. A crystal inkwell accompanies the sterling silver fountain pen as well. The Carbon Dream company of Italy is a worldwide leader in the production of composite materials in the automobile, motorcycle, marine, and aerospace fields. As with Visconti, Carbon Dream embodies the story of passion for work, know-how, excellence and perfection. For the first time, Carbon Dream has authorized production of a limited edition pen in precious carbon fibre, a product representative of the qualities of these two prestigious companies. A milestone in carbon fibre workmanship � for the first time in pen history, the fine carbon weaving has been cut into the characteristic design of the Ripple � Visconti�s manufacturing icon. The transparent resin adds depth to the pen and allows us to view the patented, titanium Double Reservoir power filler. Thus this unique demonstrator pen joins the two technological materials par excellence � carbon fibre and titanium. The flexible Dream Touch Nib is crafted from 23kt (.950) Palladium, available in widths XF, F, M, B, BB and Stub. The Carbon Dream fountain pen is limited to 993 units worldwide. A new limited edition of the revolutionary and extraordinary Visconti Homo Sapiens fountain pen. World reknown artist Claudio Mazzi once again utilizes his mastery and artistry of the airbrush, applying delicate strokes of paint to basaltic lava. Each pen features an individually hand painted reproduction of the Etna volcano using the airbrush technique. Production is limited to 388 fountain pens worldwide. Visconti lava is virtually unbreakable, flame proof, hydroscopic to absorb sweat and dense to allow a relaxing grip. Made of basaltic lava from the Etna Volcano. Nib is 23kt (950) Palladium Dream Touch in sizes XF, F, M, B, BB & Stub. Filling system is the high power vacuum power filler made of titanium to prevent corrosion. Visconti�s Knights Templar limited edition was inspired by the legendary order of the Middle Ages, remembered for its contribution to the economic development of Europe and its skilled fighting during the Crusades. The fountain pen is fashioned after the white robes and red cross the Knights wore, in ivory resin with an aged metal filigree and red enamel cross. On the crown is the Knights� seal with two figures, the warrior and the monk. The fountain pen has Visconti's power piston-filler and a two-tone 18kt gold nib. Bottle fill only. The first of Visconti�s pens based on the golden mean, or ideal ratio of phi, was the Divine Proporzione limited edition fountain pen. Hand-crafted from briar colored celluloid, the success of this exceptional pen inspired the release of the new Divine Proporzione ball pen! Present in architecture, painting, music and nature, the divine proportion was used to develop this amazing pen. Its perfect spiraling shape is crafted in rich, warm tortoise celluloid inlaid with solid sterling silver bands. The twist ball pen is just the right length for perfect balance and writing control. Limited to 618 un-numbered pieces, the Divine Propozione ball pen is truly a collector�s prize! Visconti pays homage to THE SCREAM painted by Edvard Munch. Painted in 1893, The Scream is Munch's most famous work and one of the most recognizable paintings in the history of art. It has been widely interpreted as representing the universal anxiety of modern man, as timely a topic today as it was 116 years ago. Crafted in black resin with sterling silver appointments, this piston-filled masterpiece is enhanced with a 14 kt gold nib in M, F and B widths. Only 338 pens are available worldwide. Florence, the cradle of the Renaissance, has always been considered one of the three most beautiful cities in Italy, alongside Rome and Venice. The city is well-known not only for its monuments but also for its unique craftsmanship and its taste for beauty. With a view to celebrating this magical city, Visconti conveys through a scrimshaw-like process on the fountain pen, together with a magnificent wood rolltop writing case that accompanies each pen, a special cultural atmosphere--highlighting images of the Statue of David, the Duomo and the Piazza della Signoria on the fountain pen. Seeking to absorb the values of a by-gone era, all these ingredients recall a time when communication was commonly done by pen in hand, on a sheet of hand-made paper,hand-carried to the post office or even delivered by coach. Featuring Visconti's unique Double Reservoir, piston-fill mechanism and their large, 18 kt gold nib, Visconti has strictly limited this edition to 88 fountain pens worldwide. Science and Ethics, and Secularism and Clericalism, are some of the great opposing themes of humanity which often compete against each other. Globalization and international conflicts have enlarged this dichotomy. As Visconti�s creations have often taken into account the great themes that impact one�s life, Visconti has launched a limited edition series dedicated to all religions of the world�the Mystic Collection. The Bible, being the world�s most widely read book, is the subject of Visconti�s initial release, with two instruments reflecting the two great religions linked to it: Christianity and Judaism. In a more ancient shape than the Christian Bible pen, the Judaic pens are also turned from a solid bar of ivory colored resin. Using the painstaking scrimshaw etching/painting technique, the resin is drypoint engraved and filled with calligraphy ink. After drying, the excess ink is removed with a very fine glass paper and then hand-polished. This edition relates the story of the Old Testament on the barrel with such scenes as Adam and Eve; Noah�s Ark; David and Goliath; Abraham and Isaac, and Moses and the 10 Commandments. The cap reflects the solemn moment of a prayer in front of the Wailing Wall. The 10 facets on the lower end of the barrel (�blind cap�) are reminiscent of the 10 Commandments with their form and Hebrew. The sacred Temple is hidden inside the �blind cap� and serves to activate the fountain pen�s power filler. All metal trim is made of sterling silver. THE BIBLE COLLECTION - The Mystic Pen Limited Edition (999 Fountain Pens and 199 Rollerballs). The Christian Bible pen collection is turned from a solid bar of ivory colored resin with the cap and barrel having the same dimensions. Using the arduous scrimshaw etching/painting technique, where the resin is drypoint engraved, filled with calligraphy ink and then colored by the noted artist, Claudio Mazzi, this edition reflects the story of the Old Testament on the barrel with such scenes as Adam and Eve; Noah�s Ark; David and Goliath; Abraham and Isaac, and Moses and the 10 Commandments. On the cap are featured New Testament stories of Jesus---his Birth; his Baptism; the Last Supper, and his Ascent to Heaven. The painting style hearkens to that prevalent during the Renaissance. The 10 facets on the lower end of the barrel (�blind cap�) are reminiscent of the 10 Commandments with their form and Hebrew engraving, reminding us of Moses� two stone tablets. The Holy Grail is hidden inside the �blind cap� and serves to activate the fountain pen�s power filler. All metal trim is made of gold-plating over sterling silver (vermeil). In a more ancient shape than the Christian Bible pen, the Judaic pens are also turned from a solid bar of ivory colored resin. Using the painstaking scrimshaw etching/painting technique, the resin is drypoint engraved and filled with calligraphy ink. After drying, the excess ink is removed with a very fine glass paper and then hand-polished. This edition relates the story of the Old Testament on the barrel with such scenes as Adam and Eve; Noah�s Ark; David and Goliath; Abraham and Isaac, and Moses and the 10 Commandments. The cap reflects the solemn moment of a prayer in front of the Wailing Wall. The 10 facets on the lower end of the barrel (�blind cap�) are reminiscent of the 10 Commandments with their form and Hebrew. The sacred Temple is hidden inside the �blind cap� and serves to activate the fountain pen�s power filler. All metal trim is made of sterling silver. The fountain pen includes Visconti�s large, 23kt Palladium nib, available in M, F, XF, B, BB and Stub, filled by Visconti�s exclusive Power Filler. The Christian Bible pen collection is turned from a solid bar of ivory colored resin with the cap and barrel having the same dimensions. Using the arduous scrimshaw etching/painting technique, where the resin is drypoint engraved, filled with calligraphy ink and then colored by the noted artist, Claudio Mazzi, this edition reflects the story of the Old Testament on the barrel with such scenes as Adam and Eve; Noah�s Ark; David and Goliath; Abraham and Isaac, and Moses and the 10 Commandments. On the cap are featured New Testament stories of Jesus---his Birth; his Baptism; the Last Supper, and his Ascent to Heaven. The painting style hearkens to that prevalent during the Renaissance. The 10 facets on the lower end of the barrel (�blind cap�) are reminiscent of the 10 Commandments with their form and Hebrew engraving, reminding us of Moses� two stone tablets. The Holy Grail is hidden inside the �blind cap� and serves to activate the fountain pen�s power filler. All metal trim is made of gold-plating over sterling silver (vermeil). The fountain pen includes Visconti�s large, two-tone, 18kt gold nib, available in M, F, XF and B, filled by Visconti�s exclusive Power Filler. Limited Edition - The Gordian Knot is a legend associated with Alexander the Great, often used as a metaphor for an intractable problem, solved by a bold stroke ( cutting the Gordian knot ), just as Visconti for the first time in the pen industry has produced a fountain pen with a piston fill mechanism coupled with a retractable nib! As legend has it, the Phrygians were without a legitimate king. An oracle decreed that the next man to enter the city driving an ox-cart should become their king. A peasant, Gordias, then drove into town on his ox-cart. He was declared king by the priests. In gratitude, his son Midas dedicated the ox-cart to the gods and tied its shaft with an intricate knot. An oracle further prophesied that the one to untie the knot would become the king of Asia. In 333 BC, Alexander sliced the knot in half with a stroke of his sword, producing the required ends and becoming the king of Asia. The sterling silver Metropolis sports a minimal-chic, six-sided design. The fountain pen's retractable system, which requires a few seconds to extend the fountain pen nib, has a perfect built-in mechanical piston filler. Visconti has achieved this unique feat for the first time with a watchmaker precision, utilizing over 30 components. The rollerball is likewise a retractable pen. The fountain pen includes a large, two-tone, 14kt gold nib, available in M, F and B. In each finish, only 188 rollerballs and 288 fountain pens have been produced. Double Reservoir Power Filler, the large 18 kt gold nib is available in M, F, XF and B. The Art of Peace and Harmony in Human Society. Mud�jar Art of Aragon started in Spain between the year 1000 and 1600 A.D. as a fusion between the Romanic, the Gothic and the Renaissance style, with considerable Arabic influences. This kind of art has a great symbolic meaning. It represents 400 years of peaceful and common existence of the three great monotheistic religions: Christian, Muslim and Hebrew. It is a symbol of community, labour and cooperation between three different groups of people in the same territory for the common well-being. This happened 500 years ago and still it is an example for us all, a real World Heritage. This pen is created in ivory coloured resin with finely cut scrimshaw engravings reminiscent of the Mud�jar art monuments. The grooves are filled in with copperplate printing ink and left drying for at least three days. At the end the surface is smoothed until the design appears. The pen is enhanced with an 18 kt gold nib, with filling via the Double Reservoir Power Filler. This pen was first presented in Saragossa on October 19th 2006 in the Palacio de Montemuzo, in the presence of the highest local authorities and experts of Mud�jar Art. It is the rule of proportion in the examination of nature that causes us to observe an organized universe and a universe in chaos, rational and irrational numbers, harmony and discord. These descriptions are merely proportional effects of the opposition that is inherent in all things. We see harmony expressed by those emotions, feelings, and characteristics present within ourselves. This harmony is viewed within nature as the Divine Proportion. It was closely studied by the Greek sculptor, Phidias, and took on the name �Phi�. Phi can be found throughout the universe: in the growth patterns of flowers and plants and in the behavior of light and atoms; from the spirals of galaxies to the spiral of a Nautilus seashell; from the harmony of music to the beauty in art. Throughout history, Phi has been observed to evoke emotion or aesthetic feelings within us. Witness the ancient Egyptian pyramids and Greek architecture. During the 12th century, in reliance on this scientific discipline, the mathematician, Fibonacci, developed the famous �Fibonacci Sequences�, the impetus for the Golden Spiral, in the shape of the Nautilus Seashell which is embodied in this incredible fountain pen. During the Renaissance, Phi served as the "hermetic" structure on which many great masterpieces were composed. In 1509 Leonardo Da Vinci illustrated �De Divina Proportione��the written version of an ancient oral tradition, said to have revealed a mystery. Originating with Phi, the concepts that inspired Visconti to produce this limited edition were the Golden Number (1.618, comparing the length of the cap with the length of the open or closed pen), the Pentagram (a star with 5 points; formed by 5 straight lines between the vertices of a pentagon and enclosing another pentagon) and the Nautilus. The Pentagram is inside the form of the pen itself, adapted to the ergonomic necessities of a writing instrument. The Nautilus is known as the �Golden Spiral� and, built according to the Fibonacci sequence, is �traced� on the pen body. The �Hook Safe Lock� defines a new system for locking the cap. Any accidental unscrewing of the barrel is prevented enabling a perfect connection of the golden spiral with a closed and open pen. The �Push & Pull Touchdown� is a filling system based on Visconti�s �Power Filler� technology, designed to disappear inside the barrel and being activated by a simple �click�. Hand-crafted from briar coloured celluloid, the pen is available in sterling or 18 kt gold decoration. The 18 kt gold nib is available in medium, fine, extra fine and broad widths. From Visconti�s popular �Squaring the Circle� Collection comes �Aida�, an Opera of master dimensions in blue-green �candy stripe� celluloid with mother-of-pearl highlights. It is not round, as any other pen, nor squared� as it would be then less ergonomic. It is simply unique... as all objects yearning for perfection. A fountain pen of ideal proportions! With an elegant clip, a two-colour 18 Kt gold nib, available in M, F, XF and B, with a converter filling system. Its elegant packaging includes a handsome crystal inkwell. An equally impressive rollerball is also available in an unnumbered edition. Limited to 1871 fountain pens worldwide. Throughout history, Europeans have always been �united but divided�, continuously competing against each other, while searching for their common roots and goals. Although they have recently celebrated the European Constitution, Europeans tend to always need myths to bind themselves together. Visconti has considered why European towns are so similar to each other, so often placed on hills, with winding small roads, and why the same religious symbols, churches and cathedrals, represent a common thread of the �European� lifestyle. All European forms of art that developed between 1000 AD and the late 12th century belong to the �Romanic� tradition, due to the significant presence of Roman factors. In homage to this era�s architectural elements, Visconti has adapted to these exquisite writing instruments, through chiselled engraving, the beauty of the arches, bricks and windows so prevalent then. As the Romanic era was the precursor to the Renaissance, Visconti hopes for this pen to witness a new beginning for Europe. Presented in two distinctive finishes, in an edition of 1000 pens each, the 18 kt. gold nib is available in M, F, XF and B, with filling via Visconti�s Double Reservoir Power Filler.